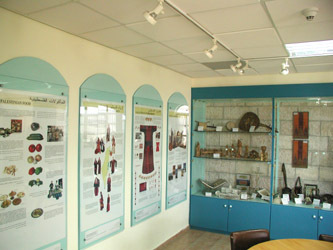 The Special Collections-Palestiniana Division was opened in 1990. Generous donations of Catholic Near East Welfare Association and Pontifical Mission to Palestine made this section of the Library a reality. Through the generosity of Ireland Aid a new addition to the first floor of the Library was constructed in the year 2000. The new center was named Turathuna: Center for Palestinian Heritage at Bethlehem University. Palestiniana Collection is now located in this center. The establishment of Turathuna is a gift from the Irish government to the Palestinian people in the spirit of Bethlehem 2000 projects. The center aims to contribute to a positive Palestinian identity through familiarity and pride in the national heritage. Bethlehem University faculty, staff and registered students may borrow materials with the same borrowing policies and procedures of the main library. Students need a valid university ID card. Visitors and researchers may request a special library card for a minimal fee. The researcher should inform the library in advance for use of the facility. This service is available upon payment of a fee. The equipment to read and print microfilm or microfiche is available; a fee is charged for printouts. Old newspapers and periodicals Falestin, Palestine Post, Mira't al-Sharq, Palestine Weekly and al-Carmel are available. The collections of some distinguished local people have been contributed. Rare books and a few manuscripts that are for room use only are included. Pamphlets, clippings, leaflets and other uncataloged materials are contained in this file cabinet. The Turathuna Center aims to be an important resource center for research in Palestinian heritage and culture. It makes its resources accessible to the general community and provides facilities for new technology to access materials. It is the location for workshops, seminars, lectures, and films. It acts as a referral center indicating places where other materials, buildings, sites and artifacts may be viewed. A series of wall panels with permanent displays on various themes is designed to have maximum visual impact and to attract attention. Display cases with rotating exhibits of artifacts illustrate a variety of different elements of the national heritage. The oral history section is based on the corner computer and consists of video-taped interviews. Detailed information with expanded text, diagrams and pictures for each display panel and rotating exhibit is available on CD-ROM format. The collection includes reference and circulating books in all fields of knowledge related to Palestine and Palestinian affairs except literary works which are kept in the regular collection.